The Journey to El Yunque middle school ecology curriculum isn't just another sugarcoated science project that's long on fun and short on real learning. According to Dr. Steven McGee, Principal Investigator of Journey to El Yunque and president of The Learning Partnership, a rigorous, standards-based evaluation of the curriculum has confirmed that students using the Journey to El Yunque curriculum gained greater understanding of population dynamics than a comparison group using a traditional ecology curriculum. McGee believes that real world problem solving and open-ended inquiry are what make the Journey to El Yunque curriculum so powerful, although further evaluation and research is needed to prove this conclusively. McGee, together with Dr. Nick Brokaw, director of the Luquillo LTER at the University of Puerto Rico, and Dr. Steven Croft, senior science education specialist at the National Optical Astronomy Observatory, recently received supplemental funding from the National Science Foundation (NSF) to conduct the next phase of the Journey to El Yunque evaluation. In addition, The Learning Partnership recently applied for $1.5 million of new NSF funding to use Journey to El Yunque as the blueprint for developing new models of assessment and new approaches for supporting the implementation of inquiry-based curricula. The success of Journey to El Yunque does not surprise McGee, considering that the curriculum is the result of a four-year, ongoing collaboration between two competitively funded NSF research programs. In Journey to El Yunque, McGee has combined The Learning Partnership’s cutting edge educational research, funded through an NSF Instructional Materials Development grant, with the advanced ecological research of the Luquillo LTER. The Learning Partnership infuses Journey to El Yunque with expertly designed curriculum, easy-to-use educational technology that supports student learning, and rigorous standards-based evaluation. Working hand-in-hand with The Learning Partnership, ecologists at Luquillo in the rainforests of Puerto Rico provide the meaningful research questions and rich datasets that are essential to the success of the curriculum. Along with Journey to El Yunque, The Learning Partnership is playing a key role in the evaluations of the “Project-Based Inquiry Science for Middle School,” a $3 million NSF-funded curriculum venture and “Inquiring with GIS,” a $1 million NSF-funded information technology experiences venture. The Learning Partnership also focuses on enhancing the learning process by providing teachers of grades 5-12 with a comprehensive suite of classroom assessment tools delivered via the Internet. For more information about Journey to El Yunque please visit http://elyunque.net/journey.html. To learn more about The Learning Partnership, contact Dr. McGee at mcgee@lponline.net. Students use interactive models to explore the population dynamics of species in El Yunque. 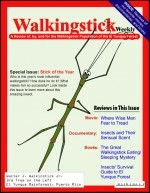 “Walkingstick Weekly”— Background reading materials are designed to both enlighten and entertain.